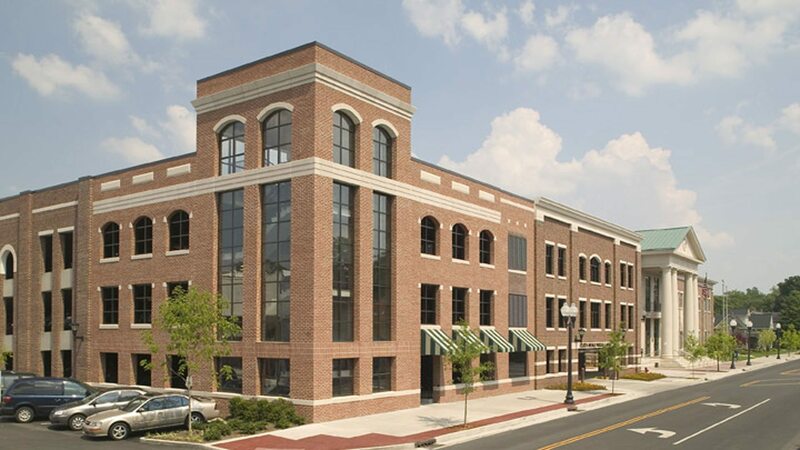 Nestled between the historic, Main Street mercantile buildings of “small-town” of Franklin, TN and a newly constructed County Judicial Center, this publicly owned parking structure was designed to blend new construction with a delicate urban fabric. The project sits on a former surface parking lot. With zero setbacks of adjacent buildings on Main Street and those across the street from the project site, this lot created a void in the framework of the downtown grid. The boundary of the new parking garage structure was pulled up to the sidewalk edge, maintaining the consistent yet unique feel of buildings common along Main Street. Doing so held true to the City’s design guidelines and continued the spirit of the urban fabric in the heart of the Downtown district. Brick, stone and other accent materials were used to cover this precast concrete structure, otherwise too harsh for this small town environment. Detail for the façade was chosen to emulate, but not replicate the architectural styles and individual storefronts found in the area. Bays between columns were divided to create a vertical break. Details such as a display window, window shutters, and canvas awnings were added at street level to further blend the garage with its surroundings. The structure provides 335 free and much needed parking stalls for the Downtown district. Patrons use the structure to visit the adjacent County Judicial Center, Main Street retail shops and town street festivals.